With a simple understanding of how your water is supplied and a little preventative maintenance, you should be able to reduce the risk of leaks and bursts occuring and be better prepared to identify and tackle them if they do happen. 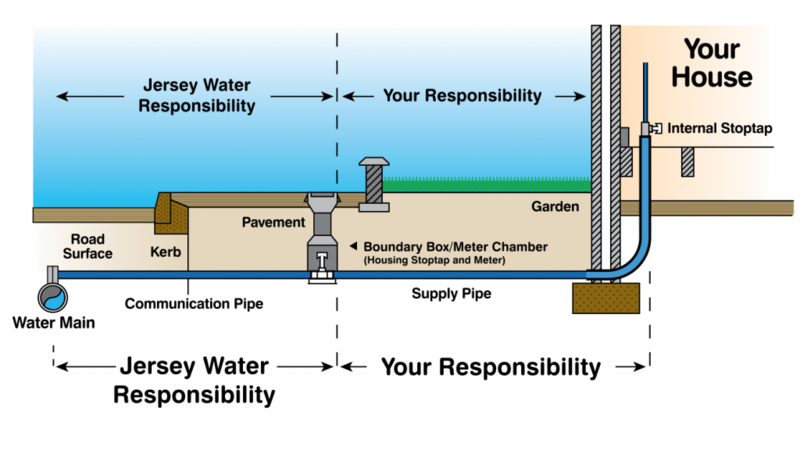 Your water supply is fed from the water main through a boundary box. The communication pipe, boundary box, meter and external stop tap belong to and are the responsibility of the Company. The supply pipe runs from the boundary box into your property. Maintenance of the supply pipe and all connected plumbing is your responsibility. The external stop tap is located in the boundary box. The external stop tap is the property of the Company and should only be operated by authorised Company representatives. Where the supply pipe meets your household plumbing should be an internal stop tap. This allows you to turn the water supply to your household plumbing on and off. The internal stop tap will usually be located where the service pipe enters your property. Spend the time to find out where your internal stop tap is located. Knowing where it is may save you important minutes when you are dealing with a burst or major leak. Once you have found the internal stop tap, check that it works; turn it clockwise for off, anticlockwise for on. If the valve is hard to turn, don’t try to force it. If the valve is seized or broken it should be replaced by a qualified plumber. To prevent a stop valve from seizing up, it is a good idea to close and open it a couple of times a year. When working on your home or garden be sure to locate all hidden and buried pipe work to avoid inflicting damage that could result in leaks and bursts. Ensure that your central heating system and hot water system are properly maintained on a regular basis and that air is regularly expelled from central heating systems to prevent internal corrosion. Where pipe work is externally corroded seek advice as to its replacement. Ensure that your plumbing systems are designed to withstand the pressures that are being exerted upon them. Converting a system over from an indirect feed system (with water storage tanks) to a direct feed system (where all pipe work is at mains pressure) or from borehole water to mains water can place considerable strain on existing pipe work and equipment. Leakage wastes water, can cause a significant amount of damage to a property if left unattended and can be costly. If you identify a leak on your pipe work you must get it fixed as a matter of urgency. An unexplained high consumption reading on your water bill. The sound of water moving through the pipes at night or when no water is being consumed. Damp, discoloured patches and/or mould on carpets, ceilings, floors or walls. Reduced or falling water pressure. A damp patch appearing on the ground or flowers and grass growing better than those around them. Especially, where this lies above the route of the supply pipe.